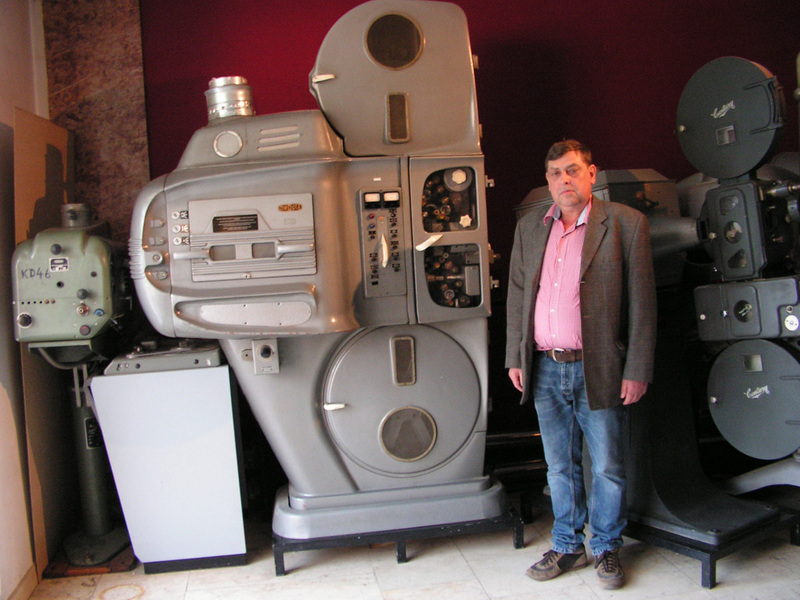 Cinema owner Pavel Nejtek next to a Meopta 70/35 projector. 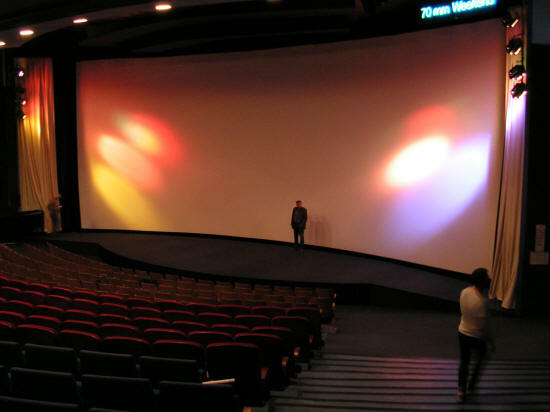 The city of Varnsdorf in the Czech Republic has a beautiful cinema called Centrum Panorama, with a curved screen of 18.4 x 7.9 metres, about 145 m2. The depth of the curvature is 1.8 m. It has a stadium seated auditorium with 550 seats and in the projection booth you will find all the necessary digital projectors (Christie) and sound processors, but they also have all classic projection technology i.e. 16mm, 35mm and 70mm. They are very proud to have two Meopta UM 70/35mm projectors, built in the seventies in the Czech Republic! So they can screen all the classic 70mm films with 6 channel magnetic sound but also the new 70mm prints with Datasat timecode. They added noise suppression for audio records without Dolby. Furthermore, they have installed Dolby A and Dolby SR and other audio systems for 70mm films having e.g. the low bass frequencies in a particular track or have stereo sound effects. On the walls you can see a total of 28 different speakers and there are five original speakers from 1971 behind the screen and eight new JBL speakers installed recently and used during the “70mm Weekend”. This was an excellent place for the 70mm weekend 2018 (the second Czech 70mm festival besides Krnov) from 17 until 20 May with a unique program of old and new 70mm films in co-operation with the Prague Film Archive, DEFA-Stiftung and the Kino Museum Berlin, who provided most of the 70mm copies. It was the fourth year this 70mm Weekend was organized. This years program started with War and Peace, part I - Andrej Bolkonskij and (a much better print of) War and Peace, part II - Natasha Rostova (1965), both German-dubbed prints prints from the Kino Museum in Berlin, followed by Gettysburg (1993) a 70mm print from the Bradford Media Museum Archive. • Go to Full Introduction for "VOJNA I MIR"
The next days they screened an extremely abridged English dubbed Old Shatterhand, a German, French, Italian, Yugoslav co-production from 1964 originally filmed with German Super Panorama MCS 70 cameras. This was followed by the famous (German dubbed) 2001: A Space Odyssey from 1968, filmed in Super Panavison 70; a brand new 70mm print of Murder on the Orient Express and a German dubbed blow-up from 1968: Guns for San Sebastian (La Bataille de San Sebastian). Followed by a German dubbed blow-up from 1968: The Shoes of the Fisherman (the third movie with Anthony Quinn), a blow-up of Close Encounters of the Third Kind ( 1977); Lawrence of Arabia, David Lean’s famous movie from 1962 filmed in Super Panavision 70, Samuel Bronston’s Circus World (1964) in Super Technirama 70 and the last movie was a blow-up from 1968 Finian's Rainbow. Many prints were more of less faded but Lawrence of Arabia was still in excellent condition. Prints were English or dubbed in German and subtitled with a beamer in Czech. 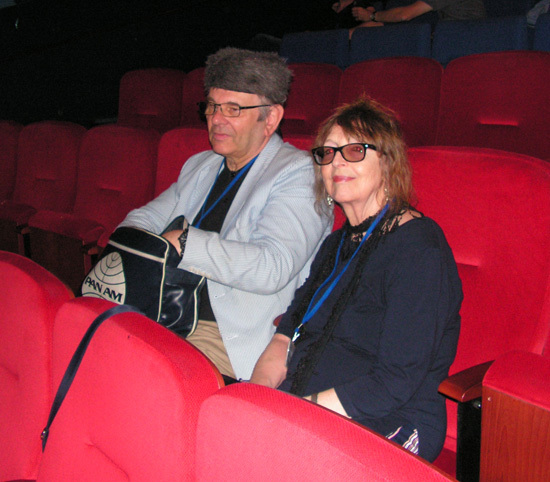 Screenings had many visitors, including visitors from Austria, Germany, The Netherlands and United Kingdom. Murder on the Orient Express was the best visited movie. 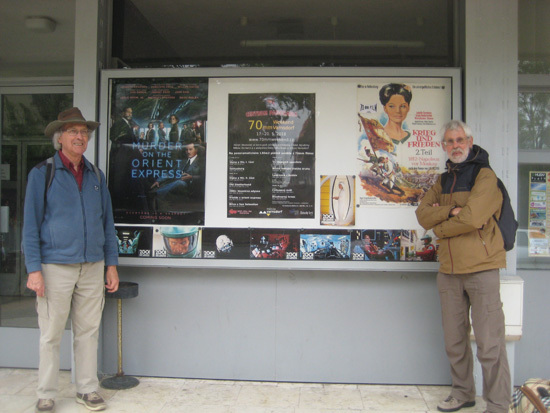 There also was an interesting digital short History of the Cinema in Varnsdorf. Some history of this unique cinema: it opened in 1971 as a project to promote the city of Varnsdorf. At that time it had a population of around 35 000 inhabitants and was well-known for its textile factories. From the beginning this cinema had the 70mm possibilities with the Czech Meopta UM 70/35mm projectors. However it closed in 1991 as a result of the closure of many factories and the decline of the city. The number of inhabitants reduced with nearly 50 percent. The cinema building and the next door hotel fell into a ruin. But In the year 2000 Mr Pavel Nejtek, who owns and still operates a Neon Lights factory in Prague, bought the building complex. Being a cinema enthousiast he started a project to completely rebuild the cinema and finally after five years, in 2005 he could reopen the cinema. The exterior building still needs much renovation and is difficult to find but the cinema interior is beautifully restored. In the same building he organised the opening of two restaurants to provide the visitors with all the necessary food and drinks. In the lobby is a large exposition of old projection equipment including a Czech Meopta UM 70/35, Dutch Philips DP75, Russian KH17/ 35mm, etc. Many of the movies were introduced by Mr Pavel Nejtek himself in the Czech language and in English by Jean -Pierre Gutzeit and Martin Šinkmajer, project manager. Some of them also in the German language by Tom Ackerman from Austria and the Russian movie War and Peace was introduced by Jan-Hein Bal from the Amsterdam EYE Filmmuseum. The projection staff did a wonderful job projecting everything reel by reel, without non-rewind equipment and had to endure much technical difficulties including a print of Gettysburg which was often out of focus because of vinegar problems (decay of film material). Before and after projection this print was stored in refrigerator boxes! The festival has been financed for 85% by the region, 6,7 % by the city of Varnsdorf and 8.3 % by the Neisse filmfestival. 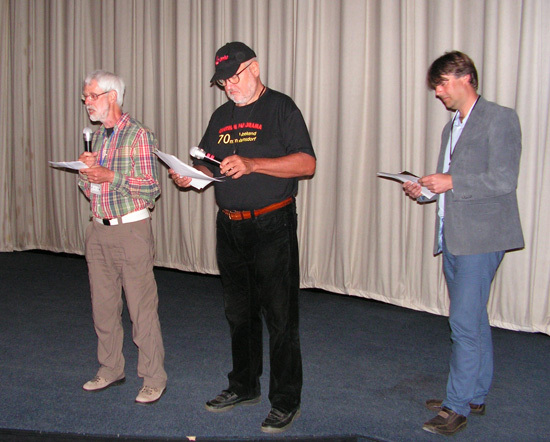 The 70mm weekend took place in the context of 15th Neisse Filmfestival, organized in 10 locations in the German-Polish-Czech border triangle from 15th to 20th May. Jean-Pierre Gutzeit from the Berlin Kino Museum should be complemented for bringing in eight 70mm movies, most of them in reasonable condition. 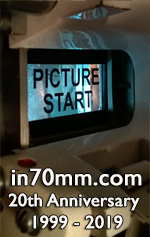 It was the fourth year this 70mm weekend was organized. The philosophy of the organization is to show movies that are very rare presented on similar 70mm festivals and to bring visitors together and provide them with high quality of food and drinks. During the festival the cinema restaurants were sometimes more crowded with local visitors than the films as these were the only cafe-restaurants in town which were still open after 18.00 p.m! The quiet mountain city of Varnsdorf is awaiting a repaired railway connection and has much closed beautiful churches and factories but also lovely restored buildings. It lies near the German/Czech border near the German city of Dresden, which is a city also very much worth a visit, with beautiful churches and other historical buildings amazingly rebuild after the disastrous bombardment in February 1945. And last but not least the beautiful Rundkino, build in 1972, with 898 seats one of the largest 70mm cinemas in the former German Democratic Republic, still functioning today in Dresden as a large digital cinema.